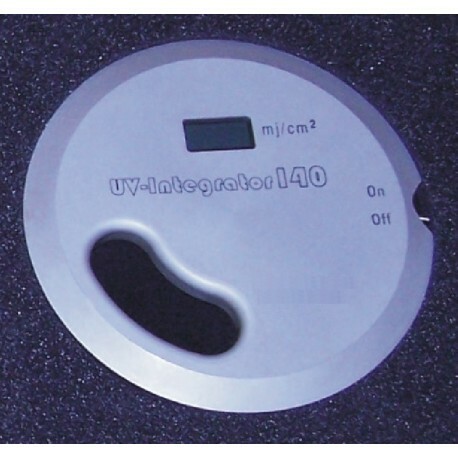 The UV-INTEGRATOR 140 W SPECIAL is a high quality UV measuring instrument. It is used to measure UV energy of different light sources, especially on printing machines. It was specially designed with a recess in the housing for better handling. It is ideal to ensure quality control of printing and drying processes. Big size, heavy duty pass-through Integrator with a diameter of 140 mm. It is reliable and simple to use. While on the conveyer belt, the UV-Integrator 140 can withstand max. 110° C / 230° F for up to 10 seconds. The temperature of the housing should not exceed 45° C / 113° F.
In order to keep its full function and precision it is recommended to have re-calibration done once per year. Recalibration will also be necessary after change of battery.